Photutils includes a general-use function to detect sources (both point-like and extended) in an image using a process called image segmentation in the computer vision field. After detecting sources using image segmentation, we can then measure their photometry, centroids, and morphological properties by using additional tools in Photutils. Photutils provides tools to detect astronomical sources using image segmentation, which is a process of assigning a label to every pixel in an image such that pixels with the same label are part of the same source. The segmentation procedure implemented in Photutils is called the threshold method, where detected sources must have a minimum number of connected pixels that are each greater than a specified threshold value in an image. The threshold level is usually defined at some multiple of the background noise (sigma) above the background. The image can also be filtered before thresholding to smooth the noise and maximize the detectability of objects with a shape similar to the filter kernel. The source segmentation/extraction is performed using the detect_sources() function. We will use a convenience function called detect_threshold() to produce a 2D detection threshold image using simple sigma-clipped statistics to estimate the background level and RMS. Note that if the threshold includes the background level (as above), then the image input into detect_sources() should not be background subtracted. In other words, the input threshold value(s) are compared directly to the input image. Because the threshold returned by detect_threshold() includes the background, we do not subtract the background from the data here. Let’s find sources that have 5 connected pixels that are each greater than the corresponding pixel-wise threshold level defined above (i.e. 2 sigma per pixel above the background noise). Note that by default “connected pixels” means “8-connected” pixels, where pixels touch along their edges or corners. One can also use “4-connected” pixels that touch only along their edges by setting connectivity=4 in detect_sources(). >>> sigma = 3.0 * gaussian_fwhm_to_sigma    # FWHM = 3. When the segmentation image is generated using image thresholding (e.g., using detect_sources()), the source segments represent the isophotal footprint of each source. In the example above, overlapping sources are detected as single sources. Separating those sources requires a deblending procedure, such as a multi-thresholding technique used by SExtractor. Photutils provides a deblend_sources() function that deblends sources uses a combination of multi-thresholding and watershed segmentation. Note that in order to deblend sources, they must be separated enough such that there is a saddle between them. The amount of deblending can be controlled with the two deblend_sources() keywords nlevels and contrast. nlevels is the number of multi-thresholding levels to use. contrast is the fraction of the total source flux that a local peak must have to be considered as a separate object. reassign_label(): Reassign one or more label numbers. relabel_consecutive(): Reassign the label numbers consecutively, such that there are no missing label numbers (up to the maximum label number). keep_labels(): Keep only the specified labels. remove_labels(): Remove one or more labels. remove_border_labels(): Remove labeled segments near the image border. remove_masked_labels(): Remove labeled segments located within a masked region. outline_segments(): Outline the labeled segments for plotting. The source_properties() function is the primary tool for measuring the centroids, photometry, and morphological properties of sources defined in a segmentation image. 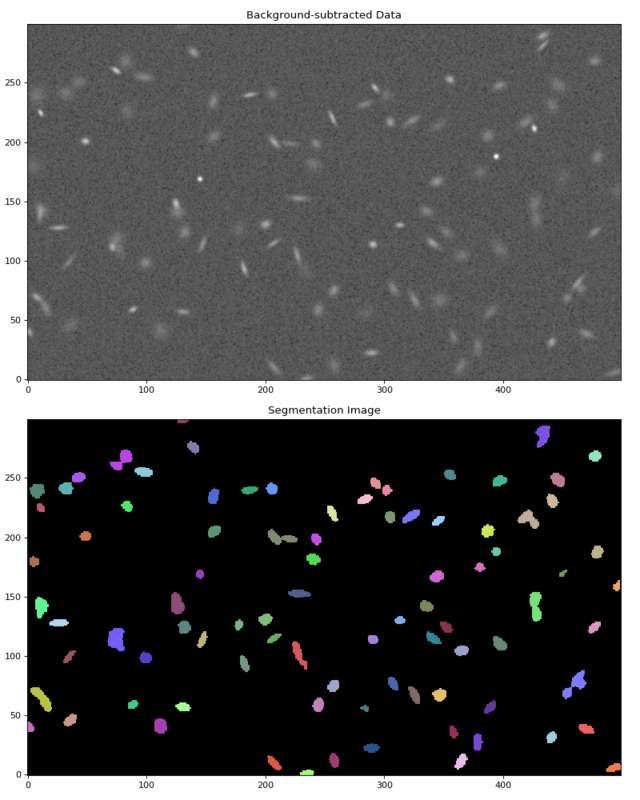 When the segmentation image is generated using image thresholding (e.g., using detect_sources()), the source segments represent the isophotal footprint of each source and the resulting photometry is effectively isophotal photometry. source_properties() returns a SourceCatalog object, which acts in part like a list of SourceProperties objects, one for each segmented source (or a specified subset of sources). An Astropy QTable of source properties can be generated using the to_table() method. Please see SourceProperties for the list of the many properties that are calculated for each source. More properties are likely to be added in the future. As described earlier, the result is a SegmentationImage where sources are labeled by different positive integer values. A WCS transformation can also be input to source_properties() via the wcs keyword, in which case the sky coordinates at the source centroids will be returned. source_properties() requires inputting a total error array, i.e. the background-only error plus Poisson noise due to individual sources. The calc_total_error() function can be used to calculate the total error array from a background-only error array and an effective gain. The effective_gain, which is the ratio of counts (electrons or photons) to the units of the data, is used to include the Poisson noise from the sources. effective_gain can either be a scalar value or a 2D image with the same shape as the data. A 2D effective gain image is useful for mosaic images that have variable depths (i.e., exposure times) across the field. For example, one should use an exposure-time map as the effective_gain for a variable depth mosaic image in count-rate units. Pixels can be completely ignored/excluded (e.g. bad pixels) when measuring the source properties by providing a boolean mask image via the mask keyword (True pixel values are masked) to the source_properties() function or SourceProperties class. SExtractor’s centroid and morphological parameters are always calculated from a filtered “detection” image. The usual downside of the filtering is the sources will be made more circular than they actually are (assuming a circular kernel is used, which is common). If you wish to reproduce SExtractor results, then use the source_properties() filter_kernel keyword to filter the data prior to centroid and morphological measurements. The kernel should be the same one used with detect_sources() to define the segmentation image. If filter_kernel is None, then the centroid and morphological measurements will be performed on the unfiltered data. Note that photometry is always performed on the unfiltered data. This subpackage contains tools for detecting sources using image segmentation and measuring their centroids, photometry, and morphological properties. deblend_sources(data, segment_img, npixels) Deblend overlapping sources labeled in a segmentation image. detect_sources(data, threshold, npixels[, …]) Detect sources above a specified threshold value in an image and return a SegmentationImage object. make_source_mask(data, snr, npixels[, mask, …]) Make a source mask using source segmentation and binary dilation. 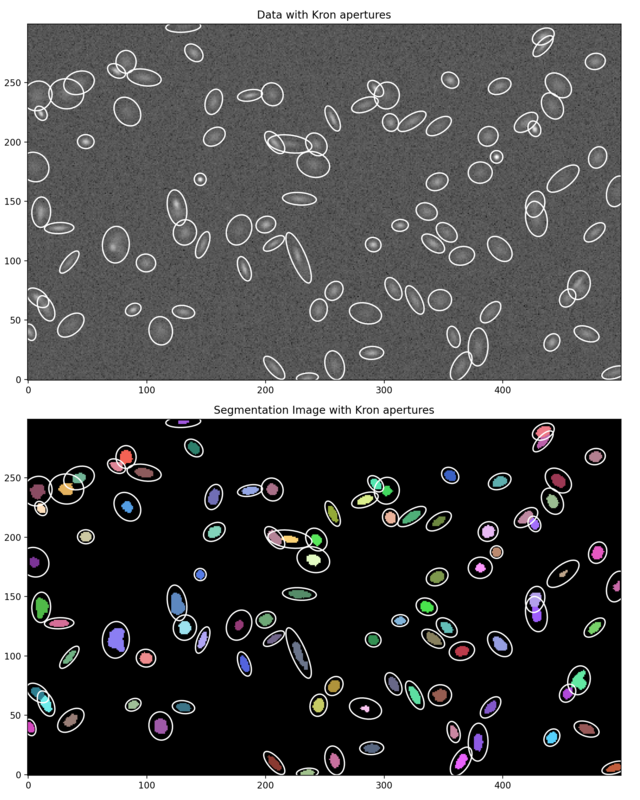 source_properties(data, segment_img[, …]) Calculate photometry and morphological properties of sources defined by a labeled segmentation image. Segment(segment_img, label, slices, area) Class for a single labeled region (segment) within a segmentation image. 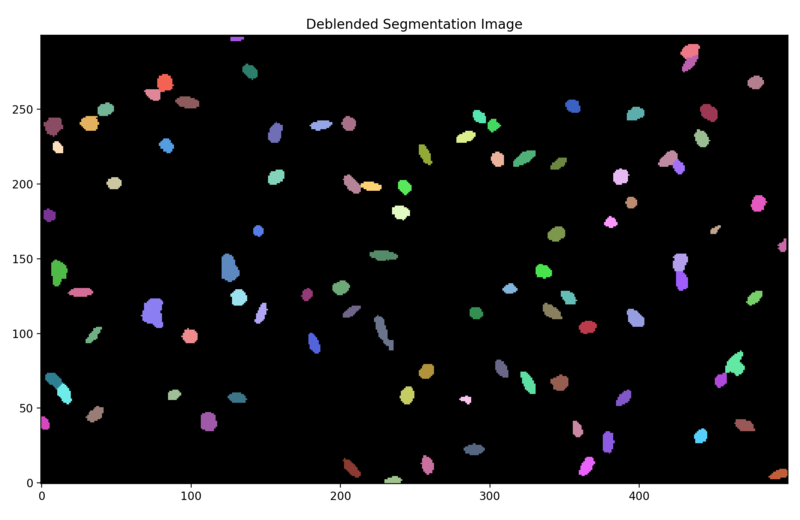 SegmentationImage(data) Class for a segmentation image. SourceCatalog(properties_list[, wcs]) Class to hold source catalogs. SourceProperties(data, segment_img, label[, …]) Class to calculate photometry and morphological properties of a single labeled source.